Obverse: Liberty head in coronet facing left. Reverse: Heraldic eagle, olive branch in right talon, three arrows in left, Dahlonega "D" mintmark below. This was a really big-ticket purchase on my modest income. 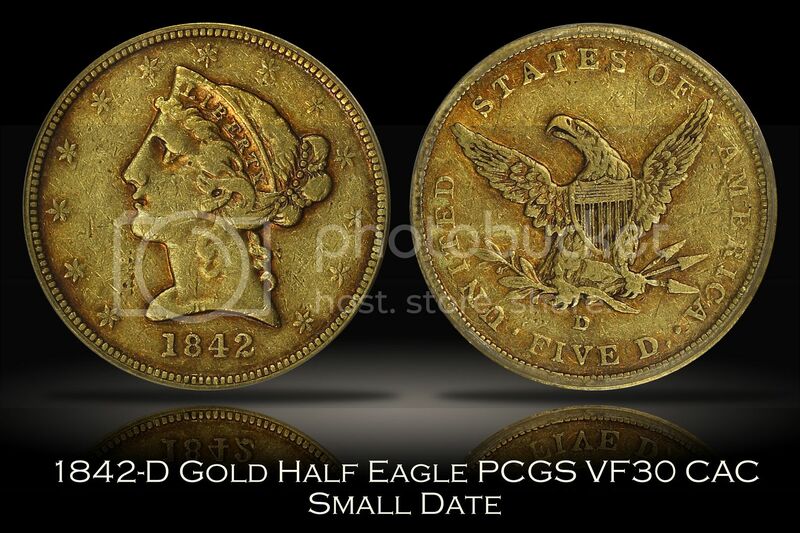 It cost more than twice the cost of my previous largest coin purchase in 38 years of collecting. In fact, it cost as much or more than many of the clunker cars I've driven over the years! I live in Georgia, and this will be my first coin from the Dahlonega Mint. I previously had owned one Charlotte mint gold dollar (with a hole obscuring half the mintmark), but that's it for the scarce C- and D-mint Southern gold. This coin technically belongs to my daughter, Victoria. Since she decided she's not into coin collecting, I sold her 1901 Victoria British Empire type set and put most of the proceeds into this coin, which I may sell ten or twelve years down the road, when she needs college textbooks or a wedding dress, or something like that. Until then, she's given me permission to reinvest and "play with" her collection proceeds. Obviously a midgrade circulated example of this coin is all we could afford. Mr. Kittle also had a Charlotte mint coin of similar grade on his website at the time I bought this, but this was the coin that spoke to me. I liked the orangey toning on it, and think it is a nice circulated example. Obviously CAC (Certified Acceptance Corporation) approved of it, too. This is my first CAC verified coin with the little "green bean" sticker on the label, which, though nice, doesn't really mean much to me personally.